Get ‘er brewed started trading in April 2013 and wanted to start a homebrew revolution, it has been an incredible journey and we are proud to now be the largest homebrew store in Ireland supplying ingredients all over Ireland and the UK. We have also recently started to ship throughout Europe. Get ‘er brewed is based in Northern Ireland we now have a team of nine. We are a small family run business , as we have grown we have invested and recruited local employees and been able to start our own Brewery and recently started our own small scale craft distillery also. We have installed professional packaging equipment and used our increased buying power to drive down prices and pass the savings on to you, our valued customer! Get ‘er brewed pride themselves in having first class customer service. We can supply the most basic starter equipment for small scale home-brewing right up to designing, supplying and installing a professional brewery or distillery. Get ‘er brewed source the finest brewing ingredients from all around the globe and we work directly with all the major manufacturers for equipment and farmers for our ingredients. We work with local malt farmers and maltsters to bring you a premium product everytime. We also act as the largest hop merchant in Ireland and buy a huge amount of the finest t90 hop pellets & whole leaf hops supplying Microbreweries and home brewers, all our hops are sourced direct from the hop farmer. 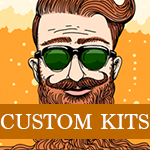 We have worked very hard to bring you innovative and exciting new products, make sure you try the Custom Recipe Builder for all grain brewing and customized beer kit service they are really leading the way in our industry and these are things we always wanted to do since we started. If you are thinking about starting a Brewpub or microbrewery then talk to us, we have the experience and skilled staff to assist you every step of the way.